The story of the United Arab Emirates(U.A.E) is a remarkable tale of how an arid barren land turned into a constellation of colossal structures, making it's the most vibrant safe haven to live for millions of people in this country. As U.A.E proudly celebrated its 40 years of reunion after the federation on Dec 2, 1971, every Emirati and expatriate residing is proud to be a part of this young country which is a testimonial to all nations across the globe that, in unity lies success. I grew up along the timeline of Dubai the last 21 years. I recall in 1991, the word gulf war was etched in my mind, observing window panes of residents covered with newspapers, I used to wonder if I was going to have a bleak future? Thanks to the Visionary late President His Highness Sheikh Zayed Bin Sultan Al Nahayan, whose guidance has been instrumental in bringing people together and creating a nation camouflaging with the magical Arabian Nights. I lived near Al-Ghurair City owned by the Al-Ghurair Family, which was the first modern mall in the Middle East. By 1994, Mc Donald opened its first outlet in Al-Ghurair City, where I witnessed the inauguration. Today Mc-Donald's itself have 90 outlets across U.A.E, aiming to reach 100 store landmark soon. A leader had a dream in 1996 to reinforce Dubai's position as a major retail hub in the region. The dream materialized into a festival - that event turned into a billion dollar shopping extravaganza. It's the annual Dubai Shopping Festival (DSF), I'm talking about. I still cherish the Inaugural Day on Feb 15th, when I turned 6 years old, seeing the city celebrate in its grandeur, attracting around 1.6 million visitors across the world and by 2009,figures show 3.35 million visitors spent approximately Dh9.8 billion in 32 days! The man behind it all was H.H. Sheikh Mo-hammad Bin Rashid Al Maktoum, Vice-President and Prime Minister of the UAE and Ruler of Dubai. Today the city boasts of the only seven star luxury hotel in the world - Burj Al Arab, designed to resemble a billowing sail has attracted international attention, ensuring its place as one of the most photographed structures in the world. The Palm Jumeirah as an international icon, was created to help solve Dubai's beach shortage, is a place to relax or immerse yourself in an exciting world of leisure and entertainment, this is a truly inspirational holiday destination, and the World tallest building - Burj Khalifa, a stunning work of art, rising gracefully from the desert at 828m, a tangible proof that success was not based on oil reserves alone, but on reserves of human talent, ingenuity and initiative. 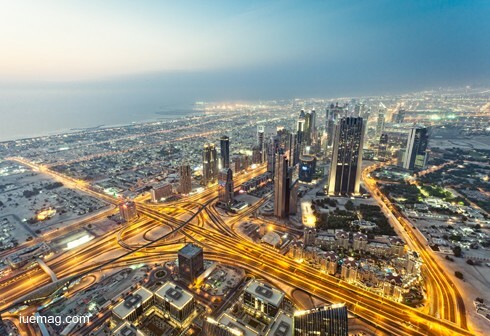 Not only Dubai says it all, but also Abu Dhabi the capital of the emirates, grown to be a cosmopolitan metropolis, is home to important financial institution's such as AbuDhabi Securites Exchange, and one of the world's largest producer of oil, lead by H.H. Sheikh Khalifa Bin Zayed Al Nahyan, President of U.A.E. The city is a unique mix of traditional Arabian charm and 21st century capital living. The Emirate Palace Hotel and Sheikh Zayad Grand Mosque add flavors to the city. U.A.E is incomplete without Sharjah's Corniche Sharjah, is known as the Cultural capital of the U.A.E., is the headquarters for the UAE Authors' and Writers' Union. Ras Al Khaimah, an emirate who has been one of the industrial centers of U.A.E, is emerging as an investment destination par excellence. Fujairah is also one of the seven emirates, has enjoyed rapid economic and social development in recent years, along with preserving it natural beauty of mountains and oasis and various historical and archeological attraction. Ajman is the smallest emirate by area is currently the only emirate in the UAE offering in-vestors of any nationality fully transparent true 100% freehold ownership on real estate, which in turn has attracted a huge number of investors (local and international) to this emirate. Lastly Umm Al-Quwain host to U.A.E 's largest aqua park and a destination for extreme sports. Did all the emirates change overnight? Definitely not! What is to be learned here is how all remained loyal to the government despite harsh times. How did the people stay committed to their dreams to turn it into a reality? Dedication, hard work and patience truly pays off. Indeed U.A.E has sown seeds keeping them ahead in the times to come.Simply because to achieve the Impossible, they learnt to see the Invisible!